During the Second World War Mussolini’s government urged Italians to keep guinea pigs to supplement their meager meat rations. Rodents are the world’s most widespread, adaptable, and prolific group of mammals. They reproduce well, grow fast, and can adapt to a wide variety of local conditions. Many are herbivores and efficiently convert vegetation into meat. Several species, like the guinea pig, the grasscutter, and the vizcacha make a very suitable microlivestock. As a matter of fact an estimated 42 of 383 cultures already eat rodents. However in most countries rodents are still unrecognized as a possible meat source. In South-America the guinea pig, or cuy as the local variety is called, was domesticated for food at least 7000 years ago. 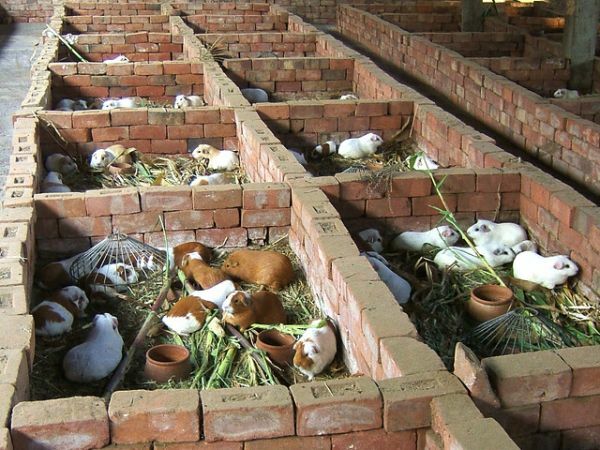 Guinea pigs require little capital or labor. They provide an inexpensive. readily available, palatable meat, are herbivorous and can be raised on kitchen scraps, have no odor, and are suitable for keeping indoors. A farmer starting with one male and 10 females could see his herd grow to 3000 animals in two years. If we decide to shrink the human species to 50cm the guinea pig’s size of 20 to 40 cm makes it the perfect farm animal.